eBay is holding a 24-hour flash sale on most items on its site. 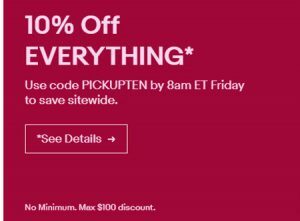 Shoppers can receive a 10% discount on orders up to $100. The sale kicked off October 25 at 8 am Eastern and runs through October 26 at 8 am. No minimum purchase necessary, and the discount applies to the purchase price (excluding shipping, handling, and taxes) of eligible items on eBay.com, cafr.ebay.ca and ebay.ca. Eligible items exclude warranties and protection plans, as well as items from the Coins & Paper Money, Gift Cards & Coupons, and Real Estate categories. Coupon must be used within a single transaction (and can include multiple eligible items), while supplies last. Max one redemption per user. Be sure to read the terms for details and restrictions. They’re so proud of this promo that they can’t bother to do a blast e-mail to members, or advertise it outside ebay. We’re left to stumble over it. Sellers with a $100+ or so FP listing could add “Save 10%” to their headline and clean up. Is there ANYBODY at ebay who can think past their nose? Will it help? Fixing their site’s basic functions likely would do much more. Example: eBay is now forcing erroneous product specifications and stock photos in our active listings. We are an authorized dealer, for everything we sell, using the correct and latest product photos and specs. We want eBay to stop adding and forcing stock photos and specs to our eBay listings, as many of their stock photos and product specs are completely incorrect. Had a number of listings that ended today with watchers and had zero sales. It looks like people do not care about eBay any more. Same here…zilch sales. Had a a couple of well-priced items over $200 go begging.